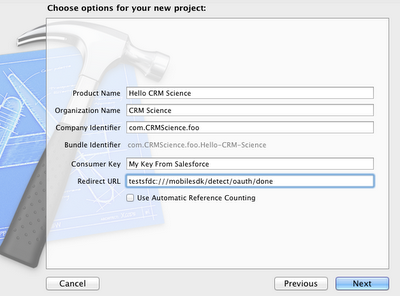 This is part three of the Salesforce Mobile SDK Series. Have you read parts one and two yet? So far we've learned the differences between native, hybird, and HTML5 apps, how to create a mobile Visualforce page, and how to create a Connected App to get our crucial Consumer Key and Secret. The next step takes what you've done and turns it into a mobile app. 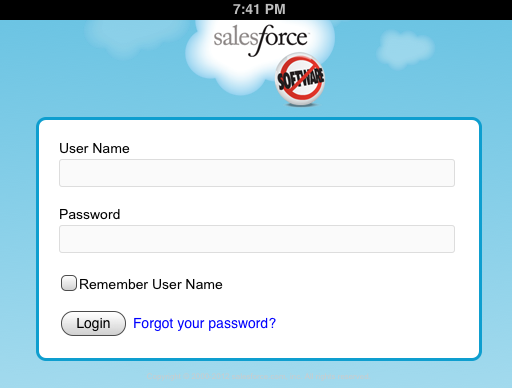 By the end of this post, you'll have an iOS app that handles authentication and delivers a multipage experience. 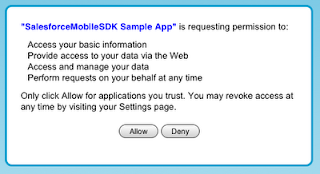 Before you get started working with the Salesforce Mobile SDK, you'll need to set up your Mac environment. 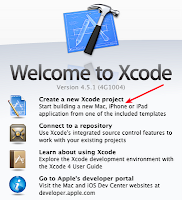 1) Boot up your Mac and install Xcode from the App Store. 5) Launch a Terminal window (Finder --> Applications --> Utilities --. 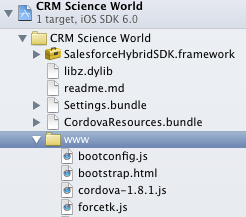 Terminal) and navigate to the cloned SalesforceMobileSDK-iOS folder, presumably in your home directory. 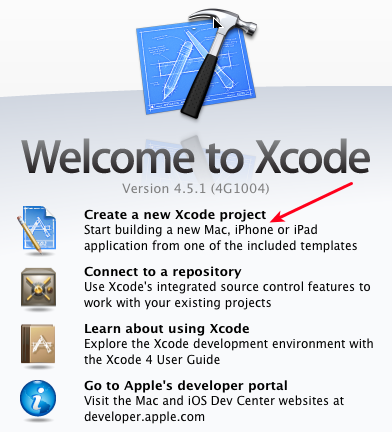 6) By now, Xcode should have downloaded and installed. If not, wait for that to happen, then launch it (Finder --> Applications --> Xcode). 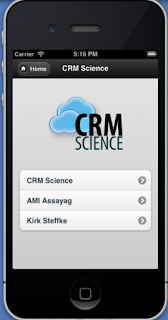 9) Provide the following details about your new app and then click on the "Next" button. 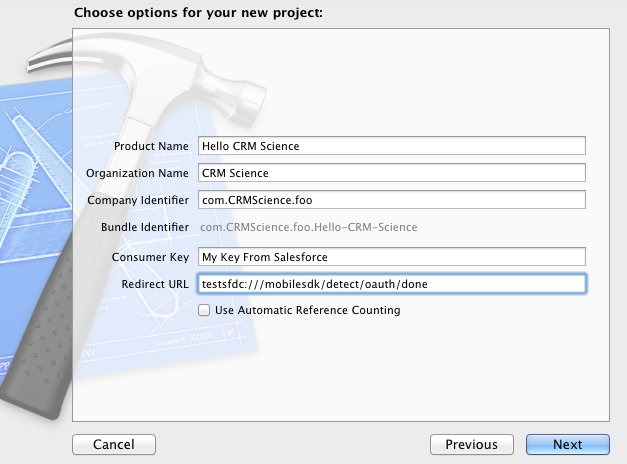 You can get the "Consumer Key" and the "Redirect URL" from within your Salesforce org by clicking on the "Setup" link and navigating to Create --> Apps --> Your Connected App Name. For more details on creating the "Connected App," see part two of this series. 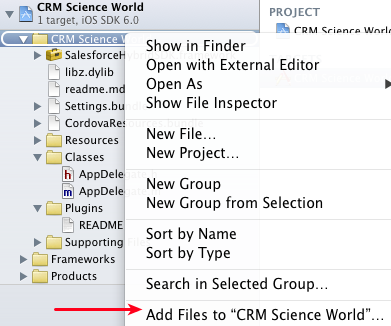 10) You'll now be prompted to choose a location to save your project file. Navigate to your location of choice and click on the "Create" button. 11) Once your project is created, highlight the "WWW" folder, right-click on it, and choose "Delete." 12) When prompted, click on the "References Only" button. 13) Highlight your root project folder, right-click, and choose "Add Files to "Your Project"..."
14) Navigate to your project directory, highlight the "WWW" folder, and then click on the "Add" button. 15) Expand the "WWW" folder in your project browser and click on bootconfig.js. 16) Find the line that begins with "var startData..." This tells the application which page to load after authentication. 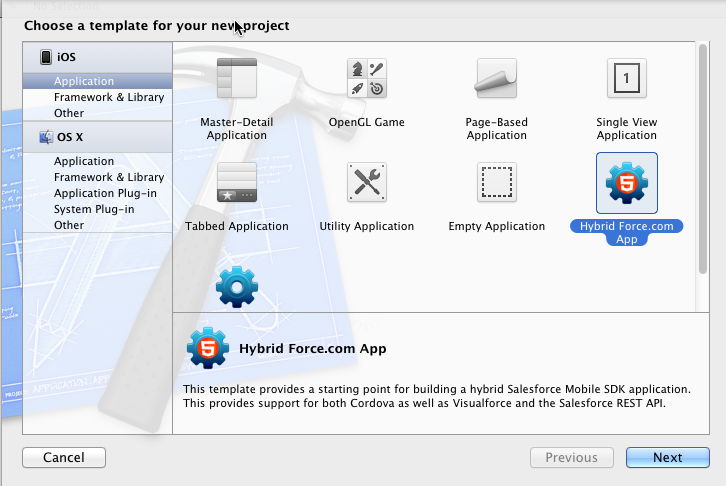 Since we are building a hybrid app, we'll comment out the first line, uncomment the second line, and modify the path portion to reference the Visualforce page we created in part two of this series. 18) Enter your credentials and click on the "Login" button. 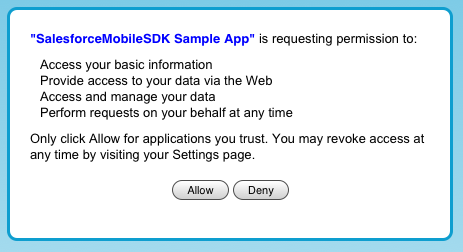 The app will then prompt you to provide permissions. Click on the "Allow" button to continue. After clicking on the "Allow" button, you'll see your mobile VF page. If you tap/click around, you'll notice the interface and page navigation looks and feels like a native app. 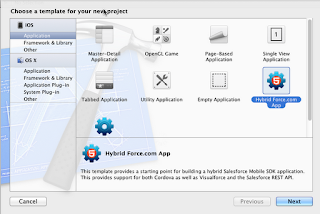 In the next and final post of this series, you'll learn how to set up your Eclipse environment and use the the same Visualforce Page and Connected App to create an Android app.